We are multi-dimensional beings living in a multi-dimensional world. Communicating with ethereal realms is your birthright. It is a sacred gift alive in every cell of your body. As we birth a new level of consciousness on the planet we are called to communicate with the vibrational world of subtle energy, the living yet invisible interconnected web of life. We travel though this communication network using our heart portal and our consciousness, accessing clear and concise information in service to the evolution of our Highest Being. We do not walk this Earth alone. Every human comes in with their own unique team of highly skilled, ascended light beings. 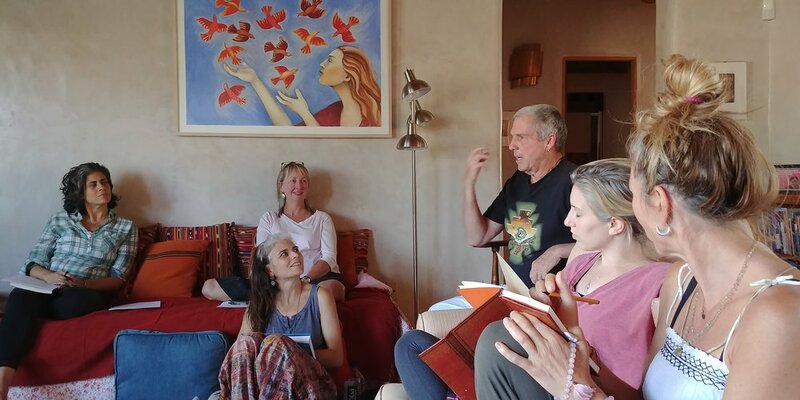 In Level One we focus on connecting to your Spirit Guides; asking who your team consists of, and learning how to begin to open a conscious dialogue. Inspired by the location of this workshop, we will also communicate with the Ancient Guardians of the land, and the elemental world. The land in Taos, New Mexico is alive with powerful energy and invites communication with us. Once we open the door to this vast Universe of the Unseens we can meet spirit guides, angels, archangels, avatars, ascended masters, devas, ancient wisdom-keepers, deceased loved ones, totem animals, star beings & more. "This course absolutely helped me to believe in my telepathic abilities! Lindsay's teaching was one of the best courses I have ever taken in my 60 years of searching. She was precise, loving, clear and supportive all the way through these four days. If you are someone who is needing more support, more affirmation, more love around your telepathic skills, this is the teacher to go to! 100 percent for sure." There is no prior experience needed for this workshop. Honing telepathic skills is just like learning a new language, requiring trust, play & practice. Your journey begins now! No prior experience necessary. 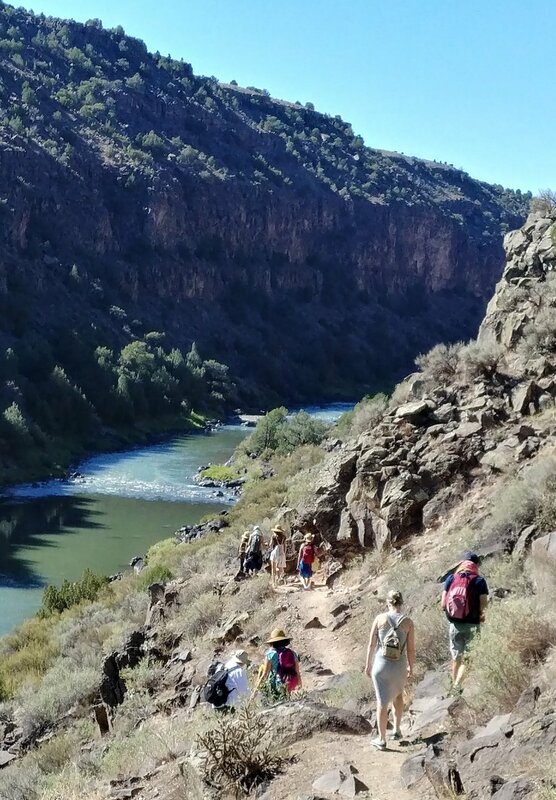 Walking down to the Rio Grande to work with the Devas and the guardians of the land. We Are All Being Called Now. It is with great excitement that I offer a deeper exploration into opening our telepathic abilities to connect with the Celestial Spiritual realms and the elemental worlds of Mother Gaia. Humans play an important role in the consciousness shift of our planet and our species. We are the energetic bridge between Heaven and Earth, enabling us to ground higher frequencies of light onto the Earth plane, as well as into our physical bodies. In Level II we will be using various projects and exercises to deepen our abilities to listen to our Spirit Guides, enlightened Star Beings, Ascended Masters, Angels, Archangels, and Earth spirits. Opening to the next level of telepathic connection where we can be of the greatest service to the Earth and humanity. We will work to clear our energy fields of any obstacles in order to become clear and strong Divine channels. And we will journey out into nature to offer our services through Earth Ceremony to this sacred land in New Mexico. Everything we create in this immersion will be channeled directly from higher guidance. With humility, vulnerability, strength, and love, we will once again step into our role as an active participant in co-creating with Great Spirit and Gaia, the Divine Human Blueprint, therein manifesting the New Earth. This course is designed for those who have already taken Telepathic Immersion Level l, OR those who are already receiving communication from other realms. Activating our telepathic skills is a lifelong learning exploration. All one needs for this course is a basic ability to receive messages in whatever forms they arrive. Oh, did I mention we will also play and have a huge amount of fun!!! Telepathic Training Level l, OR receiving communication from other realms is required to participate. We are multi-dimensional beings living in a multi-dimensional world. Communicating with ethereal realms is your birthright, a sacred gift that belongs to every human being. As we birth a new level of consciousness on the planet we are naturally called to connect with the vibrational world of more subtle realms. Once we open the door to this vast universe we can meet our spiritual guides, angels and archangels, avatars, ascended master teachers, devas and ancient land guardians, deceased loved ones, totem animals, star beings and more. Like learning a new language, honing telepathic skills requires trust, play and practice. This workshop will introduce you to your connection with divine realms, and enable you to receive guidance and deeper insight from those Beings of Light who serve as your guides. Let your journey begin now! No prior experience necessary. We have been programed to believe we are separate from the land and are unable to hear her voice. Yet there is infinite wisdom in Nature’s intelligence that is available for us to connect to, and learn from. How to communicate with the Deva or Spirits of the land, who speak concisely as to what is needed to restore harmony to any natural landscape. You will learn how to connect with Nature Spirits and come to understand their gifts and skills in creating a collaborative working relationship. We will explore how to release heavy energy from the soil of the land - often trapped human traumas from the past — to energize and up level the land’s vibration. These sacred paths of collaboration will profoundly impact all that grows on your property. "What is the Great Lesson you hold?" "The awakening of the humans is something to celebrate. We are a portal of awareness that leads you back into balance and back into the experience of the energetic living web of life, where we are all connected and alive in this vast ocean of consciousness." "Lindsay's Telepathic Immersion Workshop exceeded my expectations on all levels!! It really was a true immersion experience. I feel a sense of expansiveness in a multitude of ways. It's been two weeks since the workshop ended and I have a lasting sense of expansiveness in my heart chakra, my light body is more intact and activated and my sensitivities have increased 10 fold! In connecting to my guides and the deva spirits, I also connected deeply to the Divine presence in all. I just feel different in a most profoundly beautiful way. Everywhere I turn my attention there is magic! I look forward to continuing this study in order to increase my understanding of and connection to the unseen world. Lindsay is a stellar human being, teacher and guide. She brings equanimity to her workshop and a deep belief in the telepathic abilities of each attendee that is contagious! I would work with her over and over again." "I have grown to have the utmost respect and trust in Lindsay and her special gifts. She is grounded, humorous and unpretentious, qualities that in my experience are often lacking in those who do telepathic work. I would recommend this training without hesitation. My biggest learning was that there is a vast universe available to us, vaster than vast in fact and that we are only tapping into a small portion of it. There is so much more to learn." "Working with Lindsay was magical. She holds a caring space for personal and group telepathic exploration and development. Lindsay’s home provides a lovely and comfortable sanctuary where we were able to work comfortably. The supportive, non-judgmental communal atmosphere facilitated my burgeoning telepathic abilities. Our learning group quickly formed a loving and supportive community with whom my confidence regarding my telepathic-channeling skills became magnified. Our delicious buffet meals were lovingly presented and joyously shared at our communal table in Lindsay’s garden." "From the moment I first met Lindsay in a group workshop I knew I needed to learn from her. My sessions have been incredible, offering me information about patterns and family dynamics, guidance on making shifts, and ultimately helping me to heal and arrive at higher ground. I am stepping into my own telepathy and abilities as a healer in a stronger way. Lindsay continues to help me grow as a person and as a healer and I am incredibly grateful." "I intend to use this work in my communications with land and plant spirits. I view them with much more respect. Also, when I go out hiking I feel more respect for the land I walk upon. Asking permission to walk in, leaving offerings, getting to know the Devas and spirits of mountains, plants, streams, trees, the Earth!….I feel that these beings have so much knowledge. During the workshop, a part of me awakened that had previously been covered up or dormant. It feels amazing to know that I am able to connect with spirit and receive messages in my own way. To live a happy life! To be in understanding of why I am here. I felt very loved and supported in the group to open this path in my life. I am so grateful to have had this experience in such an enchanted place." "I am so grateful for our class, and for the inspiring experiences and messages you provided, from both you and beyond. I carry it all with me and feel moved from a deep place inside. You so exuded and embodied your teachings. Thank you from a deep place in my heart." "Lindsay is such a competent facilitator; she lives what she teaches and creates such a safe and inspiring learning environment. Lindsay provided excellent information, paced the class well, and created a magical, yet grounded place to explore various facets of telepathy. This topic was new to most of us in the group, and everyone fully engaged in the process. I left every class inspired, yet relaxed. I am so grateful to be living my life with these new, uplifting skills." "Lindsay, your class was just what I needed to get me started! I wanted my hand held as I ventured into a new world, and you did a perfect job! I now find that I can easily contact my guides and write out our conversations— an amazing source of higher information, lovingly delivered. You helped me to understand invocations, so that I could write my own. You helped me discern the difference between a guide and my Higher Self (a lot easier than I thought it would be). You prompted me to explore more widely than I would have on my own, and now the world is quite a bit bigger.... All of this has contributed massively to my sense of who we are and what is possible for us. I can’t thank you enough." "Lindsay provided a mind blowing, life altering, awe inspiring experience, in both the private session I had with her and in the telepathy course she taught. Lindsay is deeply compassionate and grounded, and a powerful cosmically connected woman. She illuminated a path to love and source I always knew was possible, but never knew how to attain. I am forever grateful for the doors she has helped me open. Thank you, thank you! Many blessings." "I had the opportunity of taking Lindsay's 8 week course on Re-Opening The Telepathic Channels. This course touched me on all levels. In fact, just as it's titled: this course touched me on levels I did not know I had! By that I mean, the levels of authentic love and understanding between my Spiritual Guides, Master Teachers and myself. We worked primarily to dissolve our own blockages that have been holding us back from reaching our telepathic potentials. So for me, I worked in areas of vulnerability and personal struggle. The guidance I received during this course and present time is the most direct and spot on guidance I have ever encountered. And I received healings simply from the awareness of deep truths gained from my Guides. Class with Lindsay was a balance of densely thought provoking, fun, emotional, heart opening, grounding, and healing. And one of the most extraordinary things I noticed was the confidence that Lindsay facilitated in me. We got affirmation from her during class and she made herself available to us outside of class time as well. But furthermore, she celebrated the way in which each of us worked and taught us how to expand upon our communications with such brilliance that I've learned how to take steps forward and most importantly how to trust. This work is real, uplifting, it is available to anyone and it is bringing about the 'new human.' For this work I am a changed woman, wife, mother, healer and artist. I embody more love and I see it reflected back at me in my family, my friends, my patients and my Spiritual Council. My channels continue to open, amaze and inspire me. I have gained tools of gold which will remain with me the rest of my life. Blessed be." "Lindsay, your class was just what I needed to get me started! I wanted my hand held as I ventured into a new world, and you did a perfect job! I now find that I can easily contact my guides and write out our conversations—an amazing source of higher information, lovingly delivered."